Spinach is an amazing source of Calcium. Just 1 cup of cooked spinach gives you 42 mg of calcium. Spinach also contains respectable amounts of Vitamin A, Iron and Selenium too. Spinach is truly a wonderful leafy green that packs a lot of nutrients. On this page you will learn about introducing spinach to babies and find great spinach baby food recipe ideas too. 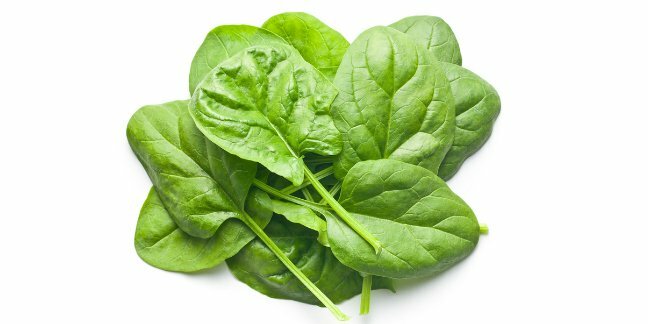 Spinach is an oxalate food as well as a nitrate food so for babies under the age of 8 months, eating homemade spinach in moderation, if at all, is a good idea – see below for information about homemade spinach. When can I introduce Spinach to my baby? Recommendations for introducing spinach to babies vary greatly. Some pediatricians say that introducing spinach between 6-7 months of age is just fine while others say to wait until 8 or even 10 months. Age recommendations on Wholesome Baby Food are more conservative in nature and there is no doubt that the recommended age for introducing spinach is very conservative. I find it would best to wait to introduce spinach into baby’s diet until between 10-12 months of age with 8 months being the earliest; this is mostly for those of you who will be making homemade spinach. Studies have shown that if not properly stored, nitrate levels may increase in spinach. Waiting to introduce baby to spinach will also allow your baby to enjoy spinach in a chopped form rather than a pureed form. As always, you consult with your baby’s pediatrician on introducing solid foods as generalities may not apply to your infant. According to the EWG, spinach is one of the “dirty dozen” foods that is most contaminated with pesticides; purchasing organic spinach is a good idea. When selecting Spinach for homemade baby food, try to purchase fresh whenever possible. You may also purchase bagged fresh spinach if you prefer. Purchasing fresh spinach allows you to select tender and firm leaves that are not wilty or otherwise damaged. Frozen spinach is an option as well. For proper storage, be sure to keep spinach in the vegetable crisper of your refrigerator and do not let it become damp or collect droplets of water in the bag. You may steam or boil spinach however I recommend sauteing fresh spinach in a wee bit of olive oil. Spinach is cooked when the leaves are soft, tender and have shrunk. Cooked spinach will appear to be stringy and “wilty”. Step 2: Steam in a pot with a steamer basket insert (water should just peek through the holes of the basket). Step 3: Leaves will shrink and appear wilted when done. DO NOT USE COOKING WATER TO PUREE. Step 5: Add fresh water until mixture is of the desired consistency. Step 3: Place spinach in the pan with the heated olive oil and sauté until tender. Leaves will shrink and appear wilted when done. Add some spices such as garlic cloves or powder, basil or onion powder if baby is able to have these spices. Step 1: Combine all ingredients and spoon into a lightly oiled (we always use olive oil.) baking dish or muffin tray. Step 2: Bake at 375 F for 15 minutes or until golden and springy to the touch. Step 3: You may wish to insert a toothpick and then withdraw it to check that the insides are done.